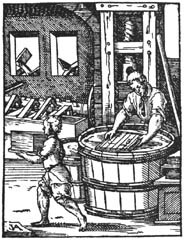 Early papermaking in Scotland was much influenced by trade links with France and Germany. Carrongrove, on the River Carron near the village of Denny in Stirlingshire, has been the site of Scottish papermaking since the late eighteenth century. Carrongrove was a family operation, founded by the owners of the Herbertshire Estate. By 1818 there were two mills operating there. Paper mills used water both as a source of power and to treat fibres. They also required a constant supply of rags. A one-vat mill, on average, could produce two to three hundredweight of paper per week. A water wheel powered a main shaft fitted with a series of cams, which lifted and dropped stampers to break down the rotten rags in the pulping troughs. An account of papermaking in the Universal Magazine for June 1752 describes the process. The vatmen dipped wire moulds into the vat of pulp, shaking out excess water to form matted sheets, then the coucher and levermen transferred them to a felt blanket where surplus water could be pressed out in a screw lever press. The sheets of paper were then hung up to be dried, sized, finished, cut and parcelled for sale. Seventeenth and eighteenth century mill production concentrated on wrappings rather than white paper for print, but with the spread of literacy, the newspaper and publishing industries expanded and new paper machines and improved technology increased output to meet demand. The introduction of the Hollander (or beating engine) and the Fourdrinier machine, revolutionised the industry. The Fourdrinier, capable of producing a continuous web of paper, 24 inches wide and up to 15 yards long, was invented in 1799 by Nicholas Louis Robert and the English Patent was taken out in 1801. A machine was installed at Peterculter Mill in Aberdeen in 1807 and the Aberdeen Journal was first printed there in 1812. Flow-line production guaranteed large-scale manufacturers a consistent, quality product at a competitive price. Machine mills opened in Dalmore (1843), Levenbank (1848), Inverurie (1858) and Avon (1860). Nine new mills opened in the Glasgow area alone at Govan (1832), Bathgate (c1834), Woodside (1837), Kelvindale (1845), Airdrie (1848), Port Dundas (1850), Bowling (1852), Clyde (1856) and Govanhaugh (c1860). Production soared to approximately 20 tons per week by the 1870s. By 1890, the number of mills peaked, with 69 in operation. In the twentieth century, the technology of paper production was further revolutionised but it still follows basic principles. Rooted in two centuries of papermaking experience, there is still a paper mill at Carrongrove. 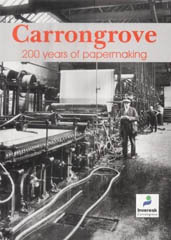 Carrongrove: 200 Years of Papermaking gives a fascinating perspective on the development of one of Scotland’s key industries. Carrongrove is now owned by Inveresk and the book is printed on the company’s own wove paper, Fulmar Ultra White, and bound in Gemini Art Board made at Carrongrove Mill. One Comment on "Two Hundred Years of Papermaking"
sad that papermaking is on the decline in scotland, Is there anybody on the end of this message anyway?